While there is no single approach to integrating adaptation considerations into sector planning, concrete examples are emerging as more countries pursue National Adaptation Plan (NAP) processes. South-South sharing of experiences through the NAP Global Network has shown that, in the early stages of NAP processes, the impetus for sector integration can be found in different ministries and at different levels depending on the country context. A spectrum of approaches to initiating sector integration of adaptation emerged, ranging from sector-driven to nationally driven approaches. Building on an earlier overview brief, this sNAPshot takes a closer look at how Grenada initiated sectoral integration of adaptation considerations, and how this compares with approaches that other countries are taking. Grenada falls closer to the “sector-driven” end of the spectrum. In this small island developing state, various sectors had already begun integrating adaptation considerations into strategies and plans with support from the Environment Division in the Ministry of Agriculture, Lands, Forestry, Fisheries and the Environment and development partners, but a coordinated and coherent approach at the national level was missing. Through the NAP process, Grenada is taking stock of ongoing adaptation efforts to identify gaps and priorities. In addition, discussions are ongoing for climate-proofing the new national sustainable development plan. View this figure online here. Grenada is a small island developing state in the southeastern Caribbean. The country has been adversely affected by extreme weather events over the past two decades. Changes in Grenada’s climatic system have presented as increased incidence of dry spells, shorter rainy seasons, increased temperature, coastal degradation and intrusion of saline water into aquifers. Economic activities are primarily dominated by tourism and agricultural production (nutmeg and cocoa) (Government of Grenada, 2015). While adaptation actions were already taking place in different sectors in Grenada, the government sees the NAP process as an opportunity to take an integrated approach to adaptation by linking local and sectoral activities with national policies. Therefore, upon initiating the NAP process, Grenada’s Ministry of Education, Human Resources & The Environment (MEHRE) began with a stocktaking of ongoing adaptation efforts and a review of the National Climate Change Policy and Action Plan (2007–2011), which was one of the first important and comprehensive outlines of the Government of Grenada’s approach to addressing climate change. This helped ensure a coherent and coordinated approach that accounts for ongoing and proposed activities and initiatives. The NAP process will fulfill an umbrella function and help the Government of Grenada to understand how to integrate adaptation activities into national development planning and budgeting and identify national adaptation priorities that could be addressed in sector plans. In terms of development planning, reducing vulnerability and building resilience is a thematic focus area in Grenada’s National Growth and Poverty Reduction Strategy (2014–2018) that draws important connections between the country’s range of natural vulnerabilities and its economic susceptibility (Government of Grenada, 2014). Moreover, the Grenadian government also decided that climate change considerations will be an integral part of the new 15-year development plan that is currently being developed, led by the Ministry of Planning. Within sectors, an Integrated Coastal Zone Policy for Grenada has already been developed in a highly participatory manner, complemented by the creation of a multidisciplinary coastal zone task force. A land-use policy is also being developed that takes into account climate change and adaptation aspects. Additionally, Grenada has integrated climate change into its Agricultural Plan and into the work plans of officers from different divisions within the Ministry of Agriculture. A national adaptation and action plan for the water sector has also been developed. The MALFFE coordinates Grenada’s climate change adaptation planning and actions. The Climate Change Focal Point of the Government of Grenada is based in the Environment Division of the MALFFE. As part of its NAP process, Grenada aims to select climate change focal points in all ministries involved in climate change-related matters. Furthermore, additional training in climate change risk analysis using CCORAL is planned to ensure that selected government projects coming on stream are climateproofed. In 2014, Grenada reestablished the National Climate Change Committee (NCCC) to act as the main advisory body on climate change for the Government of Grenada. It does not implement activities, but rather focuses its efforts on providing guidance, coordination and oversight including on “climate-proofing” development and sector planning. The Committee is comprised of 13 government members and four subcommittees: 1) Mitigation, 2) Adaptation, 3) Finance and sustainable development and 4) International negotiations and relations. All subcommittees can nominate additional members, including from the private sector and from civil society. Climate change enquiries are directed through the Secretariat of the Committee, the climate change focal point (Murray, 2015). There are a number of development partners such as various institutions of the United Nations, the Inter-American Development Bank (IDB), Global Environment Facility and the World Bank that have assisted Grenada in adapting to climate change impacts through loans, grants, and infrastructure and community projects related to climate change adaptation. Grenada has also benefited from bilateral assistance from the governments of Japan, Germany, and the United Kingdom (China and South–South Scoping Assessment for Adaptation, Learning and Development [CASSALD], 2013). With respect to donor coordination, Grenada does not have a distinct centralized unit that is responsible for coordinating climate change projects (Pilot Program for Climate Resilience [PPCR], 2015). An improved coordination approach is currently being discussed by the NCCC (PPCR, 2015). Grenada is also using the NAP process as an opportunity to strengthen institutional capacities for country coordination and to meet fiduciary principles (climate finance readiness) that would enable the country to directly access the Green Climate Fund. Grenada’s decision to initiate the NAP process (and understanding the link between the process and potential access to international climate funds) played an important role in attaining a mandate from the Cabinet for the NAP process and for climate-proofing the country’s national development plan. To date, 20 experts from various ministries, the private sector and NGOs have been trained to support Grenada’s access to climate finance. In addition, a Readiness Action Plan has been developed and is being implemented. A National Designated Authority (NDA)—the Department for Economic and Technical Cooperation in the Ministry of Finance— has been established to coordinate activities regarding the Green Climate Fund and develop guidelines for project development and national consultations. Additionally, a preliminary climate change expenditure review for the budget 2015 and 2016 was conducted. Since 2013, the Environment Division in the MALFFE receives technical assistance for adaptation as part of the Integrated Climate Change Adaptation Strategies Programme (ICCAS). Many of the NAP activities listed in this sNAPshot have been supported by GIZ as part of ICCAS. The ICCAS programme is funded by the German Federal Ministry for the Environment, Nature Conservation, Building and Nuclear Safety (BMUB) under its International Climate Initiative (IKI) and is implemented jointly by the Government of Grenada, GIZ and UNDP. Duncan, M., Ministry of Agriculture, Lands, Forestry, Fisheries and the Environment. (2015, December). National Adaptation Planning. 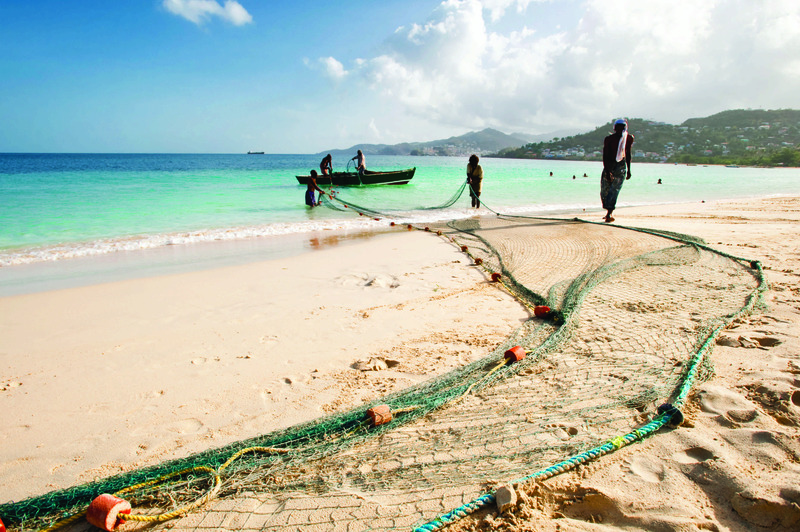 Grenada’s path to climate-resilience decision-making. Presentation at Conference of Parties 21, Paris.